After paying an obscene amount for a bachelors in urban planning and a master’s degree in public policy, I decided to take a different route to quenching some curiosity: Free. Now that I’m paying on those loans, FREE is my favorite word! I’m talking about Massive Open Online Courses, MOOCs for short. Everything from programming to graphic design to robotics to – wait… Public policy, political science and economics?! Dammit! 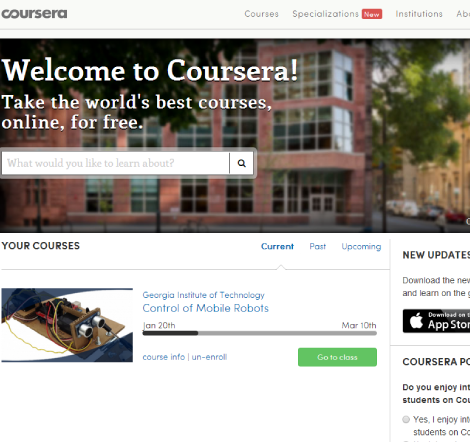 Coursera.org was my MOOC of choice for no reason other than it came up in a google search. I first tried a course on data analysis that showed me just how tiny and insignificant my limited knowledge of multivariate regression, probits, logits and instruments really was. This next course is a blast. It’s on control theory for robots. Like my heroes Tony Stark, whose only superpowers are higher education and capitalism (more on that later), and Jeff Bezos, I wanted to know more about the moving parts and programming that powers things like beer-relivering quadcopter drones and Roombas. So far it’s been awesome. Unlike in grad school, where I would spend hundreds of dollars on books with titles like “The Administrative Behavior of Federal Bureau Chiefs,” I spent a cool $80 on parts… for a robot… that I’m building. From scratch. If you think this is cool, you should see how excited my fiance will be when all of the packages arrive and I take over the kitchen table for a weekend soldering wires and swearing at wheel controllers that just aren’t counting wheel ticks like I wanted. I wish these kinds of things were around when I was in high school. Our district had a special place called the UCS Math, Science and Technology Center, or MST for short. I always imagined it to be something like the S.H.I.E.L.D academy, and from what I hear it totally was. Sweet computers, AP classes up to wazoo. Unfortunately for those like me who are only “interested” and not “gifted,” I didn’t get a shot at nerd hogwarts. A MOOC on building robots would have been a GREAT help in showing me that I had made the right decision by pursuing a social science degree that requires less than Calc I. I’ve heard there’s something called Calc 4. That sounds painful.